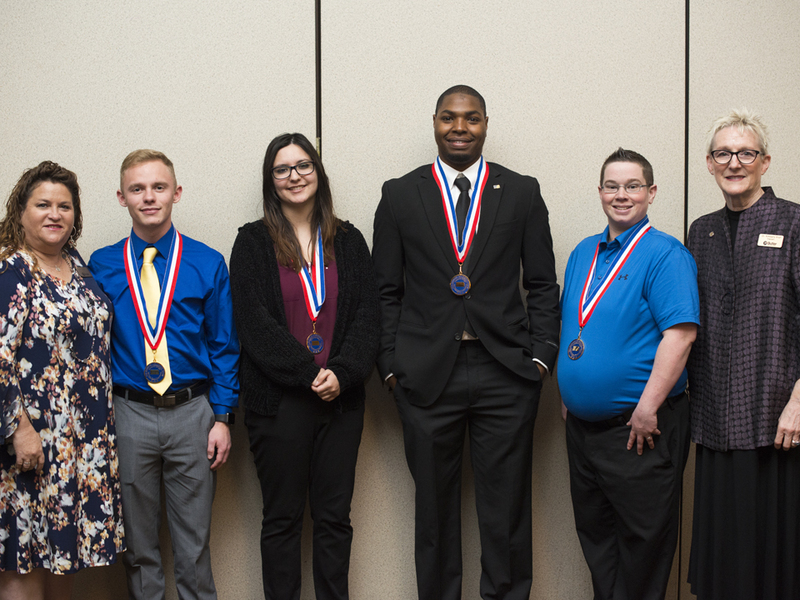 During Phi Theta Kappa’s (PTK) 24th Annual Kansas All-State Academic Team Ceremony on March 7 in Topeka, five Butler Community College students were recognized as recipients of the PTK All-State Award. The ceremony recognizes top state community college scholars and their academic achievements. The honorees met with Kansas legislators in the Capitol and were introduced in the House Chamber. After their events at the Capitol, the students were served lunch with legislators, community college administrators, faculty and staff as well as parents. During the luncheon, the keynote speaker, Dr. Brian A. Black, Human Resources and Environmental, Health and Safety Senior Site Leader for Spirit AeroSystems, addressed the need to be proud in being a part of community colleges. He reiterated that community colleges should “beat their drum.” He gave a lively speech and engaged the audience with his humor and passionate delivery. The program is sponsored by Follett Higher Education Group with additional support provided by the American Association of Community Colleges and Phi Theta Kappa. Phi Theta Kappa Honor Society, founded in 1918, is the largest honor society for two year colleges, with 1,285 college chapters in all 50 states and abroad. More than 3 million students have been inducted since the organization’s founding, with nearly 134,000 inducted annually.